To assess the protective efficacy of Spirulina platensis against collagen-induced arthritis (CIA) in female Wistar rats based on the changes in paws thickness, serum albumin, cholesterol, lipid peroxidation, alkaline phosphatase and acid phosphatase activities and histology of paw joints. Arthritis was induced by intradermal injection of Collagen and Freund’s adjuvant incomplete suspension at several sites on the back with a dose of 2 mg kg−1 of body weight and boosted with 0.1 ml intradermally at the base of the tail. CIA rats were orally treated with 200 and 400 mg kg−1 per oral of S. platensis from 0 to 45th day. S. platensis at 400 mg kg−1 per oral significantly elevates serum albumin and decreases the serum cholesterol, alkaline phosphatase and acid phosphatase activities, lipid peroxidation, paw thickness as well as normalize the joint histopathology of CIA rats. 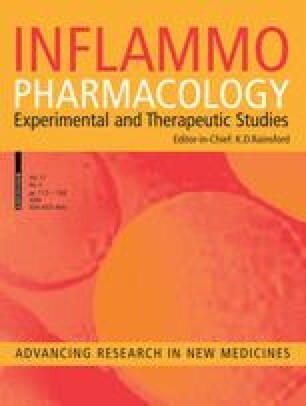 S. platensis (400 mg kg−1) significantly normalizes changes observed in arthritic rats to near normal conditions, indicates that S. platensis has promising protective efficacy against CIA rats. Financial assistance provided by Ministry of Environment and Forest, New Delhi, India for Narendra Kumar is highly acknowledged. We acknowledge use of equipment facilities developed through the DBT-HRD and Bioinformatics Infrastructure grant to the School of Studies in Neuroscience.